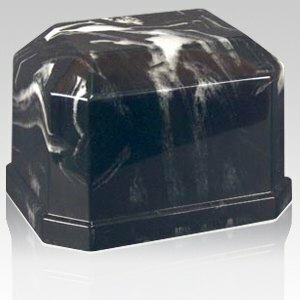 The Eden Ink Black Marble Cremation Urn is made from cultured marble. The urn's magnificent swirled color pattern and handsome shape make it appropriate for either burial or display in the home. Cultured marble is a very durable material that will outlast time and bring treasured memories for an eternity to come. "The marble urn was just what I was looking for. I'd searched many other sites and none had anything comparable. Shipping was very fast and the urn was expertly packaged."